Reed Hastings, CEO, Netflix, speaking at his company's event at Paris, France in April 2016. Sitting across from Reed Hastings, it’s hard to imagine that this man is at the helm of a company as massive at Netflix. Dressed in a crisp blue shirt and matching jacket, Hastings has a supremely relaxed vibe about him, but his eyes give away that his mind is already preoccupied with what the company is going to be doing next. Seated next to him is Ted Sarandos, Netflix’s Chief Content Officer, and within minutes of talking to both of them, it’s easy to see just how big of a vision they have for the company. From tackling piracy to launching hit shows simultaneously across the globe, there’s plenty going on at Netflix to get excited about, and still so much more they want to get done. Netflix has launched in the region very recently– how quickly do you see the catalog growing to offer more content to subscribers? TED: We just launched in January, so some of our original series had already been sold to other broadcasters in the territory. All of our upcoming originals and productions will be offered soon, along with local language options, so right now we’re expanding as quickly as we can. We’re really anxious to produce local language programming, so expanding the catalog is one of our top priorities. REED: Our first titles Orange Is The New Black and House Of Cards had mixed broadcasting rights because at the time we were really only in the U.S when we started those. But the new and upcoming titles are fully global, and we want to get it so that all of our titles are global. What are your plans for markets that aren’t native English-speaking? REED: At the moment, we’re in 20 languages, and we know we need to double that and cover the world’s major languages. We’re going to start expanding with a few new languages this year, and we’re hoping to hit more markets as we expand. When it comes to dubbing vs. subtitles, the biggest titles on Netflix will always get dubbed, while smaller titles will feature subtitles. TED: Often we give consumers both –subtitles and dubbing– and allow them to choose whichever they prefer when watching content. How has consumption changed from consumers sitting in front of their TVs at a specific time to catch their favorite shows, to simply loading up an app and watching what they want, when they want to? REED: On one level, you’re seeing things going from broadcast to cable and satellite networks, and now to Internet networks. This ranges from things like YouTube, where you have pretty low-quality videos but interesting content, up to services like Netflix where you have very high-quality 4K video content. As an example, if you look at the BBC in the UK, BBC iPlayer has become a huge success, and they’ve invested a lot into the service. Much of their viewing now is through iPlayer, so they’re moving from a linear company to something that also incorporates the Internet. How are you able to keep the service ad-free? REED: [laughs] Maybe we’ll plug some ads into your stream? But seriously, when you look at other ad-supported services, they tend to be free– such as YouTube. So, for them, it’s important to service ads to keep things going. For us, we’re all about making it a unique experience and delivering great content, while focusing on keeping things ad-free. Who would you say are your major competitors? REED: Think about where you spend the rest of your time if you’re not watching Netflix. Some of that is spent watching DVDs, some of that is playing video games, some of that is killing time on Facebook, some of that is watching on-demand and pay-per-view. We compete so broadly for relaxation time, and so it really depends by culture. With regards to other streaming services, it’s all down to the consumers. People don’t think, “Oh, I need a streaming service,” they think about relaxation and entertainment. Let’s take the US, for example, where the competition is very developed. Many of our members are also Hulu members. Many of our members are also Amazon Prime members. And almost all of our members subscribe to cable and satellite TV packages. People consume from multiple sources, just as they always have through the years. That’s why we always focus on how our service can become better, because the competition is so strong. TED: It’s one of those things too where if you love Game Of Thrones, you’re going to get HBO Now. If you love Daredevil, you have to have Netflix. So it’s not one of those things where consumers will only love one show and cancel everything else. 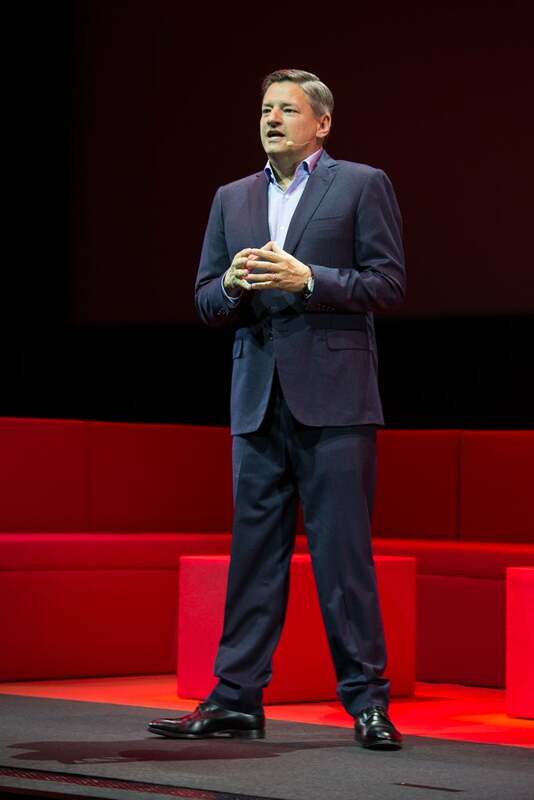 Ted Sarandos, Chief Content Officer, Netflix, speaking at a company event at Paris, France in April 2016. Image credit: Netflix. Is there any piece of content that you would love to have on Netflix that isn’t currently? REED: There are shows I watch on other networks, which are great shows, and we celebrate them. But it’s not a question of me going to Ted and going, “How come you didn’t get that show?” We can’t have all the content on the planet. There’s so much creativity going on that it’s almost impossible to try and contain it to one service. Would you ever think of showcasing events such as a talent show? TED: The more a show is event-driven, meaning that everyone has to tune in to a particular hour to see who won, we don’t bring a lot to that, simply because our core definition is on-demand entertainment whenever you want it. Traditional broadcast is built so well on attracting big audiences at one time and selling advertising to them. There are ways in which shows can be crafted in the competition space, in the news space, that are less driven by the on-demand “must watch it now” philosophy, and we’re more into looking at those kind of shows today. Do you think Netflix is something that brings competition to markets where none exists? REED: I think it does, but in every market, we compete with piracy too. There’s always competition in that way, and there’s no question that when we enter a territory, it stirs up the market a bit. If you look at Canada for example, since we entered other paid companies have merged to become stronger, prices have fallen for services, so it’s great for consumers in the way that you’d expect. TED: We look at the availability of on-demand programming from paid television operators expand interestingly right about the time we’re about to enter a market. So in that way we’re pushing a lot of innovation and the consumer wins every time, which is what’s so great about it. Given the size of Netflix’s user base and the amount of data you collect on viewing habits, how secure is all of that data? REED: We think it’s pretty secure– we work really hard on that and have never had a major breach, but things happen on the Internet that can surprise you, so we take it very seriously and work hard on it, like all other companies our size. You recently launched the next season of Daredevil simultaneously around the world– what’s it like behind the scenes before you flip the switch and it all goes live? REED: We actually invited a lot of tech journalists to that launch, so they could see just how we do it. We’ve gotten pretty good at it, and people often ask if when we launch a new series if it will ‘break’ Netflix, but we have so much at our disposal that even incredibly popular series we’re able to handle quite easily. 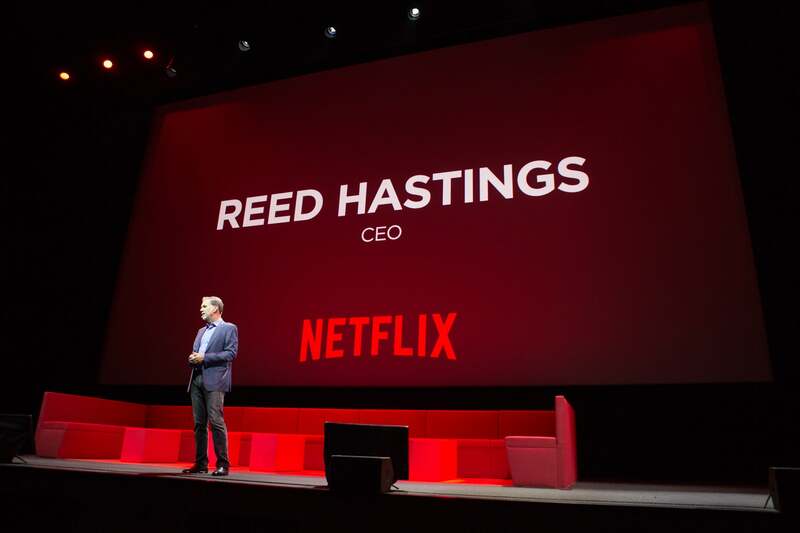 Reed Hastings, Chief Executive Officer, Netflix, speaking at a company event at Paris, France in April 2016. Image credit: Netflix. Why don’t you publish numbers such as how many views a particular show is getting? TED: It’s actually the opposite– content creators actually love that we don’t publish these numbers because it takes a whole chunk of anxiety out of the equation. The idea of publishing numbers –pitting one show against another– creates a scenario that ultimately ends up deteriorating the quality of programming. Overnight ratings have been a big driver for shows that have to be increasingly sensational to chase bigger and bigger audiences to sell more and more ads, because that is their business, so it makes sense. For us as long as people are watching our show, regardless of when they’re watching it, it’s equally valuable to us. REED: And while we don’t release ratings on a per-show basis, we release ratings for the company overall every 90 days in terms of our membership growth, and that’s the best feedback on whether or not the content is working. Netflix has become so tightly woven into the consumer space– how does it feel to be shaping and ultimately recommending what people should watch? REED: It’s a great honor to be so recognized at least in certain countries– we still have a long way to go in other parts of the world. What we want to do is to use that influence well, and provide an incredible catalog to the entire world. We joke that someday we want to produce the best Bollywood film ever made– if we can get to that level of cultural understanding that will be a great accomplishment for us. We want to have the world’s content creators excited about producing content on Netflix, and support them any way we can. What’s your opinion on VPN usage? REED: With VPNs, they’re hard to detect, but it’s not a huge issue. We know that people want the content, and the way we’re solving it is to make our content as global as we can, by releasing the new shows worldwide. Eventually, there will be no incentive to have to use a VPN at all, and we’re hoping to reach that level one day. What are you binge-watching on Netflix right now? REED: I just finished Love, which I found fantastic and really quirky, so I highly recommend you check it out.